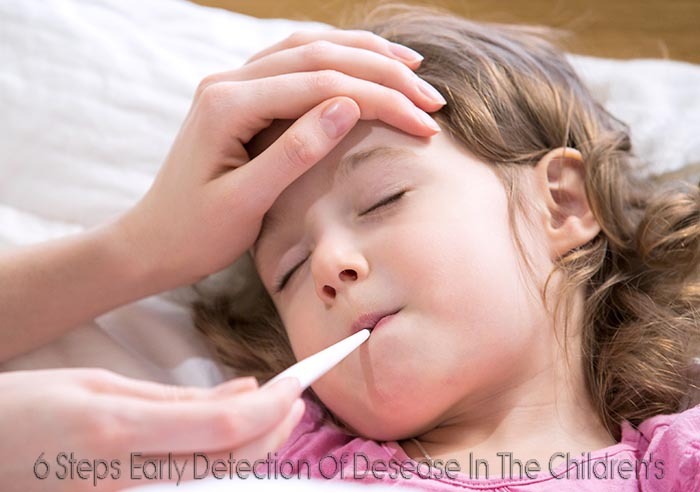 6 Steps Early Detection Of Desease In The Children's - Infinez | It is highly important that a mother should possess such information as will enable her to detect disease at its first appearance, and thus insure for her child timely medical assistance. This knowledge it will not be difficult for her to obtain. She has only to bear in mind what are the indications which constitute health, and she will at once see that all deviations from it must denote the presence of disorder, if not of actual disease. With these changes she must to a certain extent make herself acquainted. If the figure of the healthy infant is observed, something may be learnt from this. There will be perceived such an universal roundness in all parts of the child's body, that there is no such thing as an angle to be found in the whole figure; whether the limbs are bent or straight, every line forms a portion of a circle. The limbs will feel firm and solid, and unless they are bent, the joints cannot be discovered. The brows will be contracted, if there is pain, and its seat is in the head. This is frequently the very first outward sign of any thing being wrong, and will occur at the very onset of disease; if therefore remarked at an early period, and proper remedies used, its notice may prevent one of the most fearful of infantile complaints "Water in the Head." If this sign is passed by unheeded, and the above disease be threatened, soon the eyes will become fixed and staring, the head hot, and moved uneasily from side to side upon the pillow, or lie heavily upon the nurse's arm, the child will start in its sleep, grinding its teeth, and awake alarmed and screaming, its face will be flushed, particularly the cheeks (as if rouged), its hands hot, but feet cold, its bowels obstinately costive, or its motions scanty, dark-coloured, and foul. If the nostrils are drawn upwards and in quick motion, pain exists in the chest. This sign, however, will generally be the accompaniment of inflammation of the chest, in which case the countenance will be discoloured, the eyes more or less staring, and the breathing will be difficult and hurried; and if the child's mode of respiring be watched, the chest will be observed to be unmoved, while the belly quickly heaves with every inspiration. The little one that has just taught itself to run alone from chair to chair, having two or three teeth pressing upon and irritating the gums, will for a time be completely taken off its feet, and perhaps lie languidly in its cot, or on its nurse's arm. The hands of a child in health are rarely carried above its mouth; but let there be any thing wrong about the head and pain present, and the little one's hands will be constantly raised to the head and face. In the new-born infant the motions are dark coloured, very much like pitch both in consistence and appearance. The first milk, however, secreted in the mother's breast, acts as an aperient upon the infant's bowels, and thus in about four-and-twenty hours it is cleansed away. Whenever a child has the symptoms of a common cold, attended by hoarseness and a rough cough, always look upon it with suspicion, and never neglect seeking a medical opinion. Hoarseness does not usually attend a common cold in the child, and these symptoms may be premonitory of an attack of "croup;" a disease excessively rapid in its progress, and which, from the importance of the parts affected, carrying on, as they do, a function indispensably necessary to life, requires the most prompt and decided treatment. The following observations of Dr. Cheyne are so strikingly illustrative, and so pertinent to my present purpose, that I cannot refrain inserting them: "In the approach of an attack of croup, which almost always takes place in the evening, probably of a day during which the child has been exposed to the weather, and often after catarrhal symptoms have existed for several days, he may be observed to be excited, in variable spirits, more ready than usual to laugh than to cry, a little flushed, occasionally coughing, the sound of the cough being rough, like that which attends the catarrhal stage of the measles. More generally, however, the patient has been for some time in bed and asleep, before the nature of the disease with which he is threatened is apparent; then, perhaps, without waking, he gives a very unusual cough, well known to any one who has witnessed an attack of the croup; it rings as if the child had coughed through a brazen trumpet; it is truly a tussis clangosa; it penetrates the walls and floor of the apartment, and startles the experienced mother, 'Oh! I am afraid our child is taking the croup!' She runs to the nursery, finds her child sleeping softly, and hopes she may be mistaken. But remaining to tend him, before long the ringing cough, a single cough, is repeated again and again; the patient is roused, and then a new symptom is remarked; the sound of his voice is changed; puling, and as if the throat were swelled, it corresponds with the cough," etc. 0 Response to "6 Steps Early Detection Of Desease In The Children's"